Every pet owner knows the struggle of taking their dog out at night. Whether you are camping, going for a jog, or simply letting Fido run around in the back yard before bedtime, it can be hard to see where they are. If your dog constantly gets out of the fence or doesn’t always respond when called, you may want to invest in an L.E.D. dog collar to aid in keeping tabs on your pup. An L.E.D. 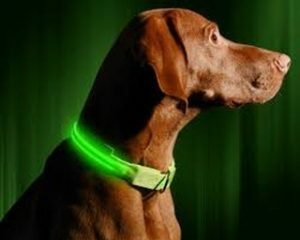 dog collar fits like a traditional collar but has the added benefit of lighting up in the dark so you can see your dog while they roam. 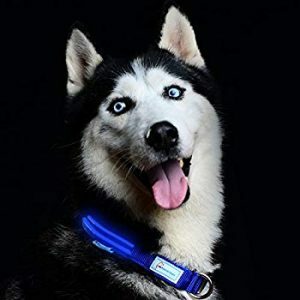 Choosing the right collar for you can be a difficult task, so we have rounded up the five best Led dog collars of 2019. Illuminseen is known for a wide variety of L.E.D. safety items. From reflective belts to horse breastplate collars, L.E.D. dog collars, leashes, and necklaces, they know what their customers want. Lifetime Guarantee – With a lifetime guarantee, these collars are a wonderful investment. If your collar does not meet your standards or has a factory defect, Illuminseen will replace it without a problem. Multiple Lighting Modes – With a one hour charge time, you are given up to five hours of light for multiple walks. Lighting modes can be switched from a steady color or the choice of slow or rapid flashing. Excellent Customer Service – Sizes range from a minimum of 8.6” to a maximum of 27.5” in their seven offered sizes. If, by chance, you order the wrong size, contact their customer service department. They are quick with returns and exchanges. With an amazing customer service department and great reviews of this product, the Illuminseen L.E.D. Dog Collar gets two paws up! Summary: While water-proofing is a nice option, this Illuminseen makes up for the lack of that feature with the others offered. With the added bonus of purchasing a matching L.E.D. dog leash, you and your pup can enjoy the night air without worrying about your dog going missing. 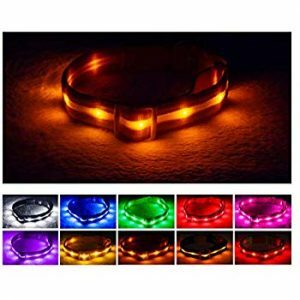 Check Illumiseen LED Dog Collar now from Amazon! Dedicated to keeping your pet safe, Pet Industries holds a 4.8 out of 5-star rating. They focus on durability, visibility, and all-weather collars. Money-Back Guarantee – Their collars are proven to be sturdy, durable, and improve visibility. They offer a 100% quality and money-back guarantees if you do not like their products. Durability- Made from quick-drying nylon and electroplated D-ring and buckle, these collars are made to last. The charging port is cleverly hidden between two pieces of nylon to avoid obtrusion. Weather-Proof – The heat welded insulation wiring allows you to use the collar in all weather conditions without concern. Rain and snow will not affect the usage of this led collar. Summary: While the quick release latch seems to have a few issues, it should not sway your opinion on this collar. Its durable design and smart charge technology are excellent. The nylon fabric is resistant to daily wear and tear, which should allow the Pet Industries Metal Buckle L.E.D. Dog Collar to be a helpful addition to your evening walks. Check Pet IndustriesDog LED Collar now from Amazon! This product comes in ten different color options with three separate lighting modes. It is lightweight yet durable. With high visibility and weather-resistance, Blazin’ Safety collars are wonderfully designed. Adjustability – As one of the slimmest bulb strip and power box options available, the one-inch band can be adjusted to reduce 40% of the total length. With overlapping sizes and adjustability, there is no guessing if your dog is between sizes. Visibility – Made from high tensile nylon and designed for visibility of up to 350 yards, this product is perfect for an evening stroll at the dog park, hiking through the woods, or camping. Lightweight and Long Lasting – The micro USB rechargeable battery can hold up to eight hours of run time when fully charged. Weighing in at only 2.9 ounces, it is lightweight enough for even the smallest dog to handle. Summary: By far one of the most visible collars, Blazin’ Safety L.E.D. Dog Collar is a great investment for those who like to let their dog run free during adventures. The durable nylon is perfect for those who like to camp or hike in heavily wooded areas. Check Blazin LED Dog Collar now from Amazon! This uniquely designed collar stands out among the rest. Rather than a traditional collar, the BSEEN L.E.D. Dog Collar is made from durable plastic tubing. Non-Traditional Design – The L.E.D. lights in the rechargeable battery pack treat the tube as if it were a fiber optic cable. The light softly deflects against the tube to give a delicate glow around the entire collar. The L.E.D. lights can be set to flashing or continuous light with the push of a button. One Size Fits All – The collar comes in only one size but is able to be cut to fit your dog. With no strands of lights running through the tube, it is completely adjustable. Built To Last – Built to withstand scratching and biting, the collar is durable for daily use. The flexible tubing is designed to hold up against anything your dog can put it through. Summary: While the connection tube can come loose after repeated use, this is easily remedied. It is recommended to cut the collar just big enough to slide over your pet’s head when putting it on. The BSEEN L.E.D. Dog Collar is an excellent one size fits all solution for your nighttime trips with your dog. Check BSEEN LED Dog Collar now from Amazon! Shine for Dogs cares about their customers and their customer’s pets. With 100% profit being donated to dogs in rescues and shelters, they are dedicated to keeping animals everywhere safe. 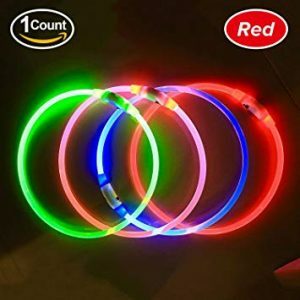 Ultra-Bright – Featuring four times the L.E.D. lights, it provides an ultra-bright illumination. Many color options are available, including the new multi-color rainbow collar. Short Charge Times – One half hour charge can yield an average of ten hours of light. With a charge time that is half of the other brands, this collar is perfect for spontaneous adventures. Resilient – Built to last with durable fiber optics and a strong snap buckle, the Shine for Dogs L.E.D. Dog Collar is fantastic. A raised button under the webbing of the snap buckle allows you to cycle through the light modes and powers the device on and off. Summary: Boasting the longest run time and a sleek design, Shine for Dogs L.E.D. Dog Collar is the optimal choice for those who want both safety for their pet and a good charity. Check Shine for Dogs Collar now from Amazon! Collar Style – Collars come in a variety of styles to suit your needs. The type of collar you will need depends on how often they wear their collar, as well as where they typically roam. Traditional Buckles – Featuring a prong style buckle this style is optimal for dogs that wear their collar at all times. Quick Release – Also referred to as breakaway collars, they are designed for quick removal in case your pet gets caught on something. Safety Collars – Typical for dogs that have larger areas to roam, they feature an extra pivot point on the center of the collar to avoid choking if the dog gets caught on a branch, rock, or something else. Material – Choosing the proper material for your collar can be difficult. If your dog is a water-loving breed, you would not want a collar that doesn’t breathe well. If your dog tends to break collars fairly quickly, you’ll want something more durable. Nylon dog collars – The most common collar material, they are sturdy, pliable, and typically fairly cheap. Waterproof Biothane – This coated polyester material can hold up to water, smells, and temperature changes. They are a great option for active dogs who love the water. Leather – More of a traditional type collar, it is strong and durable so it can hold up to almost anything your dog puts it through. Size – When picking the collar size for your dog, you want a collar that is snug but can still fit about two fingers between it and your dog’s neck. The easiest way to determine size is to take a measuring tape, measure your dog’s neck, and add two inches. You want it to be able to stay on but not choke or strangle. 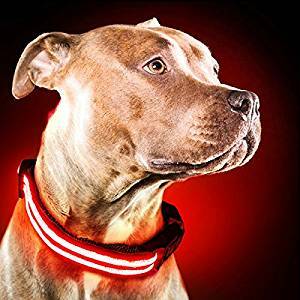 With so many great choices, it’s hard to narrow down the best led dog collar. They are a must have for all pet owners. Research has proven the vast majority of fatal accidents involving pets could be avoided by maximizing your dog’s visibility at night. L.E.D. collars are a safe and effective way of doing so.